LEMON FRESH – Stinky garbage disposals aren’t so festive. Clean them out by slicing an orange or a lemon and run it through the disposal. This will kill any non-flowery odors from invading your kitchen. It’s also a great time to deep clean the kitchen sink. LOOKOUT BELOW!– Check underneath vanity cabinets for any signs of active leaks. Look and feel for any water on shut-off valves for slow leaks as well. Hopefully you find cabinets that are dry as a bone; but if you don’t, repair the leak and air out the cabinet. Once the cabinet is dry, clean carefully with bleach to help kill any mold or mildew that may be growing. TIME FOR A CHANGE— Changing out your air filter in your HVAC system will help your system run more efficiently, save you money and help cut down on pesky airborne allergens. The best part is it only takes a few minutes! LIT— Walk the perimeter of your home to check exterior light fixtures. Look for broken or burned out bulbs or missing globes and replace them all while you’ve got the ladder out. The days are about to get longer, but exterior lighting is great security. COILS —Summer heat and the days of running your air conditioning 24/7 are coming soon to a living room near you. Clean your A/C coils now so you’re ready to chill when the heat hits. If you’re not sure what a coil thingy is, consider calling your favorite A/C company or check out a “how to” video online. It is not difficult to DIY and also not expensive to have professionally serviced. Cleaning the coils will add years to the life of your unit and keep it running at peak performance. SPRING IN YOUR STEP—The flowers are blooming and you know what that means—spring cleaning! (I know, everyone’s favorite thing!) A great place to start is by deep cleaning your flooring and wiping down baseboards. If you have carpet, consider having your carpets professionally cleaned. Start washing and cleaning all fabric in your home—from rugs to curtains and anything in between. It will get rid of the dusty bits that have gathered since the last cleaning. 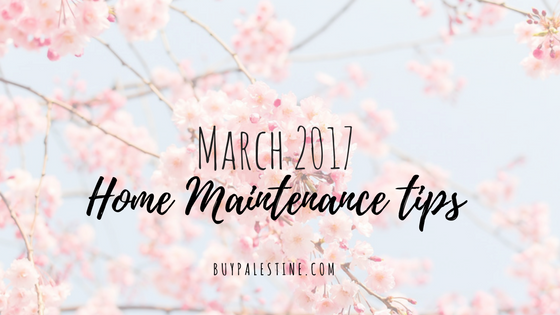 Home maintenance may seem overwhelming and it is easy to slack behind in winter months, but spring is a chance to get back in gear. A little maintenance goes a long way and will save you many future headaches and lots of money long term. A well maintained home is a happy (and maybe flowery smelling!) home. Lisa E. Priest is ready to put the coats away for good and is an East Texas Area REALTOR® with Picket Fence Realty, Inc. You can reach her via phone or text at 903-948-3343 or read more at BuyPalestine.com.